3 years & up. 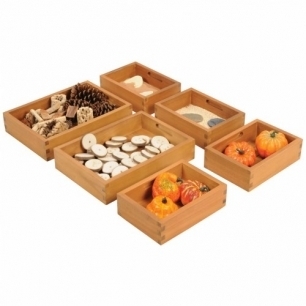 This set of six sorting boxes have inbuilt handles and consist of two large and four small that all fit neatly into our Outdoor Sorting Table with Lid. Perfect for sensory exploration and taking the classroom outside. Boxes are made from solid eucalyptus. Small boxes measure 7"W x 3 1/4"H x 9 1/2"D and larger boxes measure 9 1/2"W x 3 1/4"H x 14 1/4"D.